A low profile footboard on this shelter bed allows the headboard to make a statement. 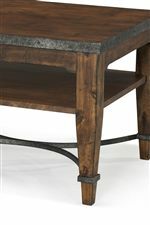 Bold curves and simple molding come together to give you a piece with simple character. Create a master bedroom you love to spend time in with this king bed. The bed sits on bracket feet for a classic look that will look great in your room for years to come. 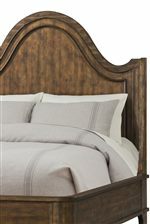 The Trisha Yearwood Home Patricia King Shelter Bed by Trisha Yearwood Home Collection by Klaussner at Furniture Barn in the Pennsville, Bear, Newark, Hockessin, Middletown, New Castle, Townsend, Talleyville, Wilmington, Marshallton, Smyrna, Elkton, area. Product availability may vary. Contact us for the most current availability on this product. 920-066FB KFBD Patricia King Footboard 1 83" 6" 18"
920-066HB KHBD Patricia King Headboard 1 82" 8" 70"
920-066SR KRLS Patricia King Side Rails 1 72" 3" 12"
The Trisha Yearwood Home collection is a great option if you are looking for Casual Cottage furniture in the Pennsville, Bear, Newark, Hockessin, Middletown, New Castle, Townsend, Talleyville, Wilmington, Marshallton, Smyrna, Elkton, area. 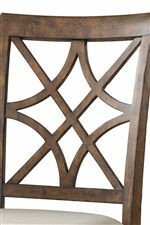 Browse other items in the Trisha Yearwood Home collection from Furniture Barn in the Pennsville, Bear, Newark, Hockessin, Middletown, New Castle, Townsend, Talleyville, Wilmington, Marshallton, Smyrna, Elkton, area.